The LeapFrog line of educational toys and electronics for children has been very popular with kids and parents alike, and that company has now released the LeapPad Ultra Learning Tablet. Designed for children aged 4 through 9, the durable kids electronic tablet is available in green or pink. Educator approved like all LeapFrog products, this multifunctional "toy" educates your children while they are playing, and deserves an in-depth look. 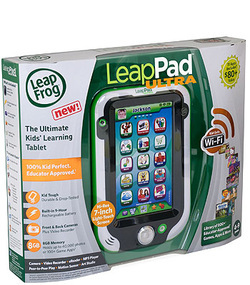 Is the LeapFrog LeapPad Ultra Learning Tablet Right For Your Child? Parents familiar with the wonderful LeapFrog lineup of educational devices for kids will immediately consider this latest model of the popular tablet. 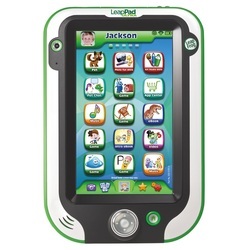 Built with rugged construction to put up with misuse from children, this electronic kits tablet provides access to the more than 800 LeapFrog apps, videos, e-books, games and music the company offers. The display is a 7.0-inch backlit touch activated screen, created for a children's touch. The web browser on board offers a Kid Safe experience and secure surfing, and only pre-approved content is accessible. There are already 11 apps included, like Art Studio Ultra for little artists, Photo Fun Ultra for future shutterbugs and an MP3 player with 10 preloaded songs. You can purchase more LeapFrog titles as an option, but with the 11 apps that are already on board, that is not necessary. There are both front and back facing cameras, and video recording capability. A full 8.0 GB of internal storage space is provided, and there is an onboard calculator, notepad, calendar and a clock with stopwatch. Also included in the LeapFrog LeapPad Ultra Learning Tablet is a free download of your child's choice, and the above-mentioned parental settings allow you to dictate just what your child can and cannot see. A stylus is provided and can be used instead of your child's fingers, and the LeapPad Ultra now records in 480P resolution, as opposed to the 240P of the LeapPad 2, so the clarity improvement is a nice plus. The tablet also has a port for additional game cartridges, and any previously purchased games will transfer to the new LeapPad Ultra when you register the device. Old LeapPad cartridges also fit. Physically the miniature tablet is sized perfectly for young hands, and the home screen menu offers touch accessible buttons with labels your child will understand. A full 9.0 hours of rechargeable run time is possible from the enclosed lithium-ion battery, and the educational tablet comes with an AC power adapter, USB cable, quick start guide and parental guide. This is another great offering in the LeapFrog line, and the parental controls and high-tech features offer you peace of mind, and help young minds explore.